Our success story for today is another cat. Willow’s foster Mom decided it was a good fit and made it official. 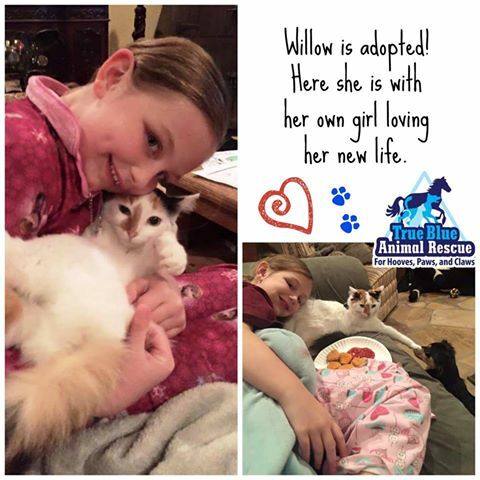 Willow gets to stay with them forever!! If you’d like to adopt a cat, horse or dog, go to www.t-bar.org and see if we have one that would be right for you. Then call 936-878-2349 or email help@t-bar.org and we’ll arrange a visit. Adopt, don’t shop! Posted in Cat Success Stories and tagged adopted, Cat, Happy Tails, rescue, success, Success Story, TBAR, Texas, Thank You, True Blue Animal Rescue.